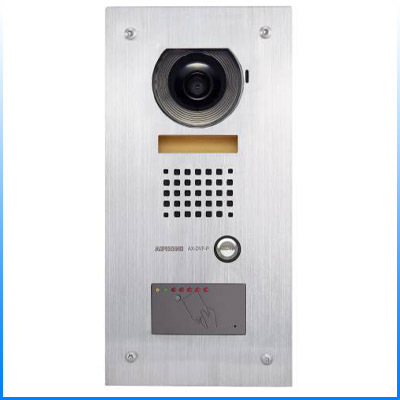 Video Door Station W/Stand alone Prox Reader - The AX-DVF-XP is a vandal resistant, flush mount door station used with AX open voice, color video entry series. The unit contains a stand-alone proximity card reader with embedded host controller. Capable of storing up to 5,000 sets of credentials (cards) and operating completely independent of an external host controller or PC. Ideal for all installations where reliable, inexpensive and easy-to-manage access control is desired. The AX-DVF-XP faceplate is cast aluminum, the camera is protected with a clear Lexan lens cover. The AX-DVF-XP features a color CCD camera, speaker and mic for communication, illuminated call directory and white illumination LED for low light conditions.